In the Trenches is a game system about WWI tactical combat. It is comprised of two starter packs and at this writing four "Battle Packs". "Coup De Grace" is the first of these and covers a small portion of three western front battles. The first scenario "Probe into the Bois De Caures" follows a German probe after a saturation bombardment and to knock out four strongpoints along the French line. Total losses so far: 2 French Platoons (of 8 and a machine gun crew) and two Germans (of 12). 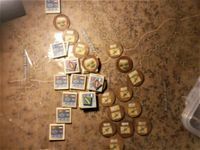 This is the first round of the first turn, and normally several rounds are fought before it ends. The exception being if both sides roll the same initiative result at the start of any round, which is what happened. So it will be interesting to see who wins the initiative at the start of turn 2. It's going to be bloody no matter who wins it. The French win the initiative by two, they consider running down the trench likely outdistancing the Germans easily, but still possibly suffering reaction fire, they choose instead to stand and fight. They do so to devastating effect. Half of the German A and E companies are slaughtered by point blank machine gun raking and good marksmanship. French élan comes to the fore. Some of the Germans attempt to fire back but to no effect. 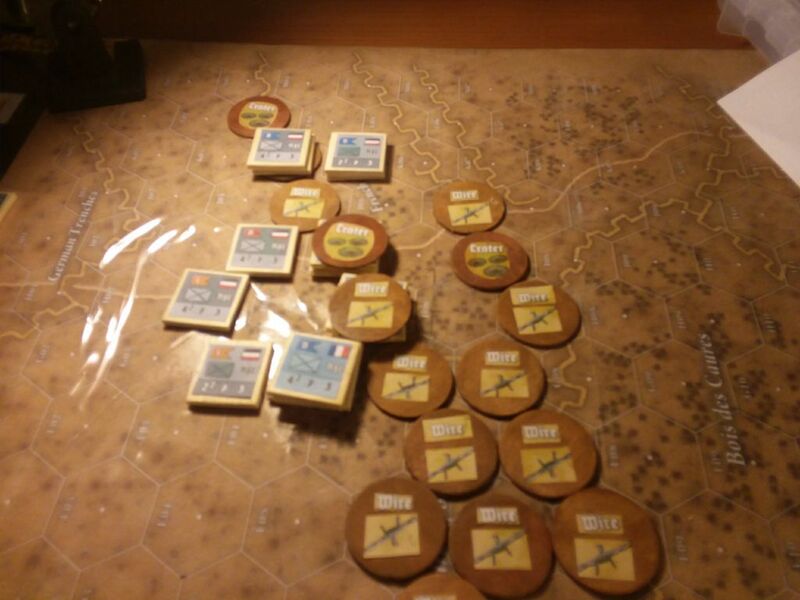 The two platoons that advanced unopposed on the far east part of the map now come running up to the action, just within of range of French troops. For round 2 of turn 2, the French again win the initiative, but this time only by one. They fire their remaining untried company, and score a step-in casualties on the Germans, and force the rest to hit the dirt. With only one activation, the Germans fire ineffectually. The Germans win round three by three. This will allow them to fire everything they have left, but considering just how effective French fire has been, and that so much of their effort this turn has been in running towards the trench line, they are firing at half strength. They score a step in casualties but little else, the trenches offer very good cover for the French. The Germans win initiative on the first round of turn three, by three. Instead of trying to move in for close-combat where they will be subject to reaction fire, they choose to fire from their current positions to cause some casualties and soften up the enemy. They cause some damage as the French lose a platoon. 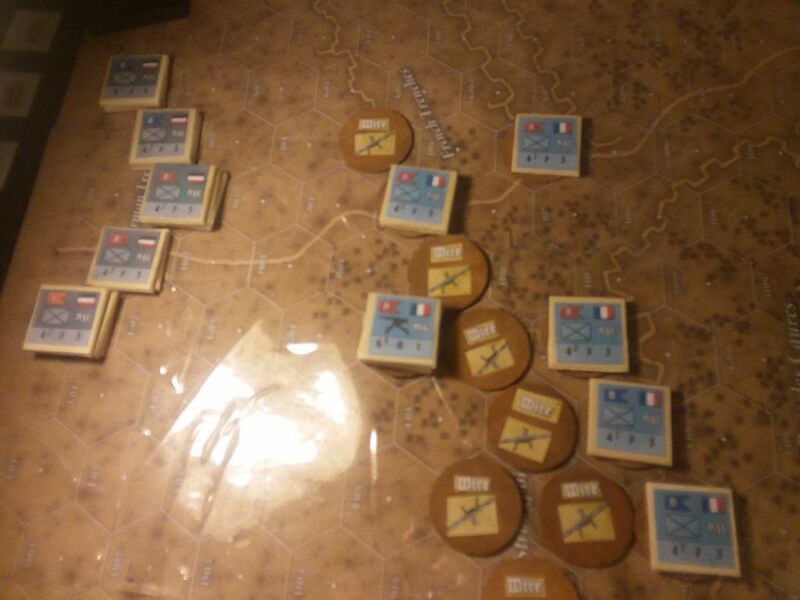 The French return fire with everything they have, causing a little more damage and disrupting the rest. The next initiative roll is equal, ending the turn. No movement at all has occurred in turn 3. Turn 4 opens with the French winning the initiative by two, and opening up with their dreaded heavy machine gun, which claims more lives, as does poilu riflemen in the same trench. Again, the Boche return fire from their B Company on the east and cause further casualties. Then with their heavily damaged platoon assaults the same position, the French platoon already weakened attempts to react, but their fire does nothing to the oncoming Germans. Carrying their assault with bayonet and sharpened shovels…they manage to wipe the French platoon out, while themselves suffering so many losses, that they too are eliminated. Both sides roll equal initiative dice, and the turn ends. The French win the initiative at the start of turn 5 by three. This enables them to fire everything they have, which, amazingly, has no effect at all. The Germans, feeling desperate launch most of their forces at the French, not all will make it some will at least draw fire. Two platoons travel within the French trenches hoping to close in for close combat. Reaction fire damages and halts one of the platoons, the other manages to come through unscathed. Above the trenches other French forces fire into Germans approaching their targeted comrades. This also causes substantial losses. In the trench where the Germans have finally come to grips with the despised French, they suffer more deaths and the poilus don’t. 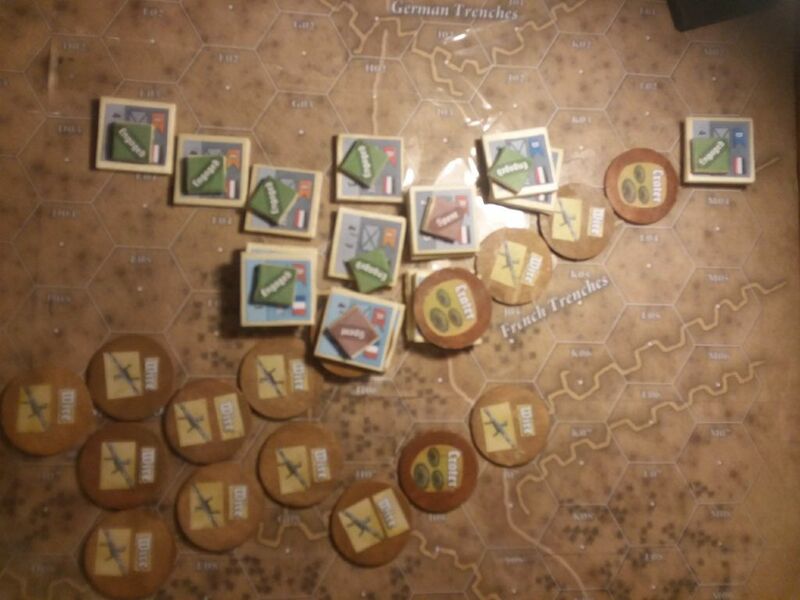 While the groups remain engaged, the Germans are now unlikely to emerge victorious. Before turn 6 arrives, the Germans concede.